Thurston Middle School eighth graders Cole Curtis and Ashton Azadian have rallied to help Laguna Beach’s homeless population by collecting 50 used coats over the last month for ASL guests. A duo of Thurston Middle School eighth graders has rallied to help Laguna Beach’s homeless population, collecting 50 used coats over the last month for guests of the Alternative Sleeping Location in Laguna Canyon. Ashton Azadian and Cole Curtis erected collection boxes at City Hall, the Chamber of Commerce, the Laguna Beach County Water District, and the Susi Q Center. The two 14-year-olds were motivated to do more to help the homeless after cooking and serving dinners at the Alternative Sleeping Center. “It was pretty surprising when I saw the homeless caught in the rainy weather, so it made me want to get them coats and feed them to make them feel better,” Ashton said. 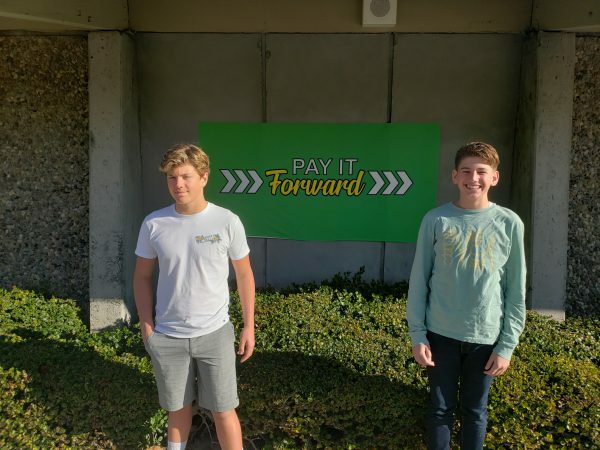 Coincidentally, Thurston Middle School launched its Pay it Forward Film Festival this school year to encourage students to produce short documentaries about their community service. About 18 videos were submitted this year and screened to students on Wednesday. Ashton and Cole were excited to take home first prize in the Best Picture category. “I think it reached out to our friends and peers and it sort of inspired them to also help out the community by donating coats and jackets,” Cole said. Principal Jenny Salberg said the film festival is the culmination of efforts to foster a positive environment on campus under the Where Everyone Belongs program, which enlists seventh and eighth graders to mentor sixth graders on how to be successful in their first year of middle school. Next year, Salberg hopes to see up to 100 documentaries entered in the Pay it Forward Film Festival so more students can showcase their volunteerism in Laguna Beach. The “Warm for the Winter” coat drive started with one collection box at the Laguna Beach County Water District about three weeks ago, and after speaking during public communications at the City Council meeting on March 19, Ashton and Cole were able to expand to other municipal buildings. Paula Hornbuckle-Arnold, executive director of the Laguna Beach Chamber of Commerce, invited the boys to install a box at the Chamber’s office after hearing them speak at the City Council meeting. The boys’ parents are also helping them to make house calls in Laguna Beach to pick up coats and jackets from residents cleaning out their closets this spring. Cole said partnering with Ashton on Warm for the Winter made sense because the pair has worked well together on past school projects and they both enjoyed their experience serving food to the homeless at the Alternative Sleeping Location. Ashton’s father, James Azadian, said he tries to show his sons the importance of giving back to their community by donating to the Boys & Girls Club and local schools through the Azadian Family Foundation. “It’s my intention that my sons do not squander the blessings they’ve been granted and use what they have to help other people,” he said. Dawn Price, executive director of Friendship Center, which operates the Alternative Sleeping Location, said she hadn’t had the opportunity to meet Ashton and Cole yet but was happy to hear that two Laguna Beach students felt compelled to help people experiencing homelessness.